Vancouver, British Columbia, November 28, 2018 (TSX Venture: EMX; NYSE American: EMX) – EMX Royalty Corporation (the “Company” or “EMX”) is pleased to provide an update on advancements of the Company’s royalty and mineral property portfolio that totals over 90 projects on five continents. These assets provide revenue from royalty, pre-production and other payments, as well as upside optionality from operator funded projects. EMX’s diversified business model of royalty generation, royalty acquisition, and strategic investment provides multiple avenues for growing the Company’s portfolio and building shareholder value. Please see the global portfolio map below and www.EMXroyalty.com for more information. Note: Annotated projects with stars are discussed in this news release. EMX received its initial cash distribution of US $65.15 million from IG Copper LLC’s (“IGC”) sale of the Malmyzh project (“Malmyzh” or the “Project”) located in Far East Russia1. EMX’s strategic investment in IGC resulted from the Company’s recognition of Malmyzh in 2011 as an early-stage copper-gold porphyry opportunity with excellent discovery potential. EMX took a disciplined investment approach by backing IGC’s steady advancement of the Project over the years. This work included the early-stage exploration work that led to the discovery of the Malmyzh district, and the drill intensive programs that progressed the Project through resource definition and approvals in the Russian Federation. The execution of these programs, with strong financial and management backing from EMX, culminated in the sale of Malmyzh to Russian Copper Company for US $200 million, of which US $190 million has been released from escrow. The remaining US $10 million from the sale is being held in escrow, and subject to certain conditions, cash distributions of up to US $4 million will be made to EMX as funds are released over the next 12 months. EMX’s royalty property interests include Leeville in Nevada, the Timok Project’s Cukaru Peki deposit in Serbia, and properties being advanced by operating companies in Turkey, the western U.S., and Scandinavia. EMX’s royalty generation programs are filling the mineral property pipeline with new acquisitions on open ground in geologically prospective regions. North America. There are 38 properties in the portfolio, of which fifteen are royalties or optioned for an EMX royalty interest, as well as other consideration to the Company’s benefit. The Company advances the western U.S. royalty generation portfolio through its wholly-owned subsidiary Bronco Creek Exploration (“BCE”). EMX’s Leeville 1% gross smelter return royalty covers portions of Newmont Mining Corporation’s (“Newmont”) Northern Carlin Trend underground mines, including the Leeville and Turf operations. Newmont produced ~358 royalty gold ounces from Leeville in Q3 providing production royalty revenue to EMX of ~US $435,500. Royalty production was sourced from Leeville (65%) and Turf (35%). Newmont is exploring a trend of gold mineralization that extends southeast from the Leeville mining complex, and is partially covered by EMX’s royalty position. As discussed by Newmont, this trend, which includes the Rita K and Full House projects, is an important contributor to its Northern Carlin Trend underground resource and reserve development strategy. In addition, Newmont has highlighted “strong results South and West of Four Corners” and the “NE upside potential subparallel to the West Bounding Fault”, both of which include areas covered by the Leeville royalty property2. EMX has a 2% net smelter return (“NSR”) royalty covering the Hardshell Skarn claim block, which is part of South32 Limited’s (“South32”) Hermosa property in southern Arizona. The Hermosa property’s Taylor zinc-lead-silver carbonate replacement development project is directly north of EMX’s Hardshell Skarn royalty claim block. In Q3, the project’s previous owner, Arizona Mining Inc. (“AMI”), announced the completion of the plan of arrangement whereby South32 acquired all of the issued and outstanding common shares of AMI3. South32 expects to invest approximately US $100 million at the Taylor project in the 2019 fiscal year4. To date, two angle diamond drill holes have intersected high grade polymetallic zinc-lead-silver mineralization within EMX’s royalty claim block5. Anglo American concluded phase I reconnaissance drilling at the Copper Springs property in Arizona, which is under an option agreement with EMX. The program consisted of four holes totaling over 5,700 meters that tested concealed porphyry targets. The alteration and mineralization assemblages observed from bedrock intercepts are encouraging. Anglo American advises that it is planning a phase II follow-up program of additional geophysics and drilling. EMX optioned Copper Springs to Anglo American for cash payments and work commitments, and upon Anglo American’s earn-in for 100% interest in the project EMX will receive additional payments and retain a 2% NSR royalty interest6. EMX’s option agreement for the Greenwood Peak project in Arizona with a wholly owned subsidiary of Antofagasta plc (“Antofagasta”) was terminated in Q3. Earlier in 2018, Antofagasta concluded a three hole, 1,035 meter reconnaissance drill program to test a concealed porphyry target, and intersected weak alteration in bedrock. EMX has dropped the property due to a lack of encouraging results. EMX’s generative work focused on new copper and gold targets in Arizona, the Great Basin, and Wyoming. The Company also completed property reviews with potential partners, and is in discussions with several groups for the available North American projects, as well as for regional generative alliances. Turkey. EMX holds five royalty properties, including Akarca, Balya, and Sisorta, as well as two available royalty generation projects in Turkey’s Western Anatolia and Eastern Pontides mineral belts. Çiftay Insaat Taahhüt ve Ticaret A.S. (“Çiftay”), the owner of the Akarca gold project, made the fourth pre-production payment of ~US $610,000 to EMX (the cash equivalent of 500 troy ounces of gold) in Q3. Receipt of this payment leaves a pre-production total of 5,000 ounces of gold (or the cash equivalent) to be paid to EMX by Çiftay on a schedule of 500 ounces every six months. EMX retains a sliding scale royalty (subject to certain deductions) ranging from 1% to 3% for gold production from the property7. Çiftay advises that a scoping study is underway that includes diamond drill results announced earlier in 2018, such as 9.5 meters averaging 50.30 g/t gold and 29.2 g/t silver in the Arap Tepe “Zone C” area (true width ~85-95% of intercept length)8. Çiftay advises that its follow-up 2018 exploration programs are awaiting drill permits. At the Balya lead-zinc-silver royalty property, Turkish owner Dedeman Madencilik San ve Tic. A.S. (“Dedeman”) advised that it is continuing with its ~25,000 meter step-out drill campaign to fill in a ~500 meter long corridor between mineralization at Hastanetepe, where underground development work has been concentrated, and the Southern Zone target area. Dedeman provided EMX with initial results from the program, which included 12.75 meters averaging 11.39% lead, 5.92% zinc and 225.18 g/t silver in hole DB108-B (true width ~95% of intercept length), as well as other intercepts in nearby holes at Hastanetepe9. EMX has an uncapped 4.0% NSR royalty interest covering Balya. The Sisorta gold project’s Turkish owner, Bahar Madencilik Sinayi ve Ticaret Ltd Sti (“Bahar”), advised Environmental Impact Assessment (“EIA”) work is ongoing under the mine permitting process in Turkey. Once complete, Bahar intends to continue applying for the permits necessary for project development. EMX has an uncapped 3.5% to 5.0% NSR royalty interest covering Sisorta. Serbia. EMX has a 0.5% NSR royalty covering the Timok Project’s Cukaru Peki copper-gold deposit10. Nevsun Resources Ltd (“Nevsun”) controls the Timok Project’s high-grade Upper Zone (characterized by epithermal-style mineralization), and is in a joint venture with Freeport-McMoRan on the Project’s Lower Zone (characterized by porphyry-style mineralization). Nevsun announced a friendly, all cash agreement in Q3 to be acquired by Zijin Mining Group Co. Ltd. of China for US $1.41 billion11. 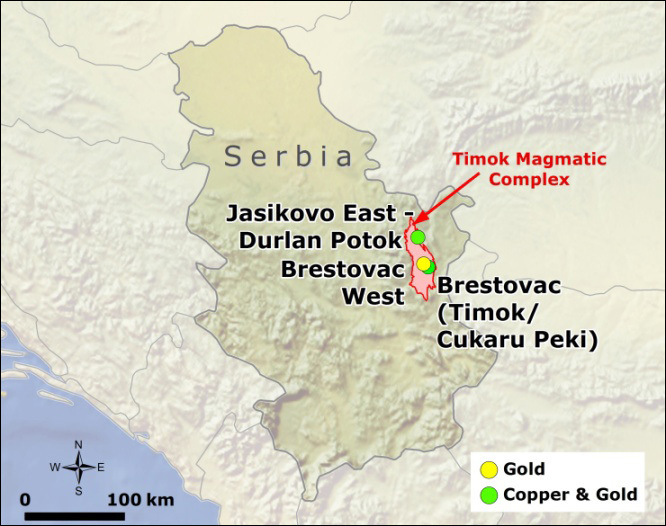 EMX’s royalty properties in the Timok Magmatic Complex add significant upside potential from one of the world’s top copper development projects. Scandinavia. 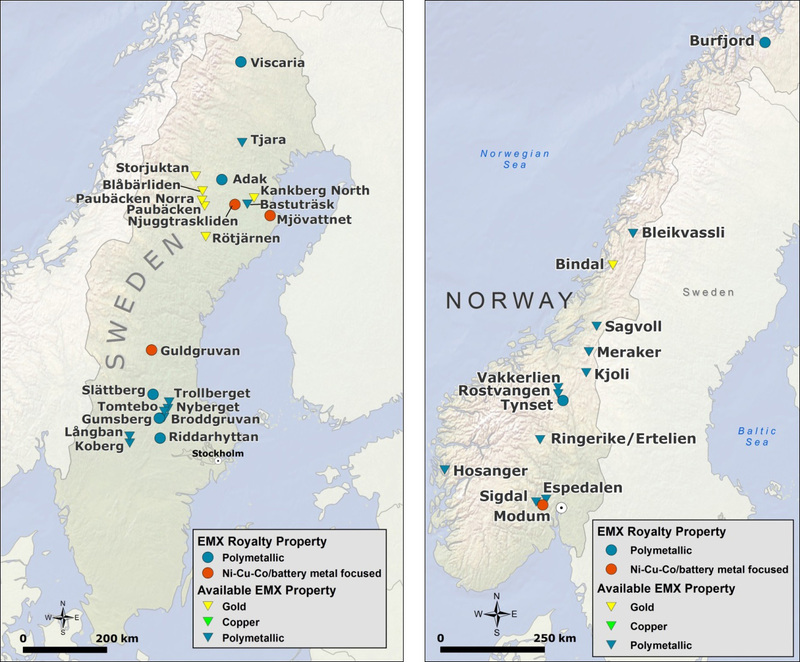 EMX’s portfolio in Scandinavia totals over 35 royalty and royalty generation properties in Sweden and Norway. The Company has converted multiple properties to royalty and equity interests, while adding value via early-stage exploration to royalty generation properties that are available for partnership. EMX has eight royalty properties sold to, and operated by Boreal Metals Corp. (“Boreal”) and Boreal Energy Metals Corporation (“BEMC”), a subsidiary of Boreal. The sale of the properties included uncapped 3% NSR royalty interests, equity interests in Boreal and BEMC, annual advance royalty payments, and other consideration to EMX’s benefit. The properties consist of polymetallic, cobalt, nickel, and copper projects. In Q3, Boreal a) commenced exploration programs at the Tynset volcanic massive sulfide (“VMS”) project in Norway, b) identified prospective geophysical targets at the Gumsberg VMS project in Sweden, and c) commenced a 1,000 meter reconnaissance diamond drill program at the Burfjord copper-gold project in Norway14. EMX provided technical assistance for this work on a 100% reimbursed consulting basis. At the Riddarhyttan iron oxide copper-gold (“IOCG”) and massive sulfide project in Sweden, which is optioned to South32, EMX conducted geologic mapping, geochemical sampling, and geophysical surveys during Q3 on a 100% reimbursed basis. The geophysical work included high resolution VTEMTM (airborne time-domain electromagnetic) and aeromagnetic surveys over the entire Riddarhyttan license area. These new data are being used to generate drill targets on the project. Riddarhyttan was optioned to South32 for cash payments and work commitments to earn a 100% interest in the project, and upon earn-in, EMX will receive annual advance royalty and milestone payments in addition to a 3% NSR royalty interest15. Riddarhyttan is the locality where the element cobalt was first discovered and recognized, and is also the type locality of certain rare earth elements and related minerals. Geochemical sampling and geophysical surveying was conducted in Q3 at the Slättberg nickel-copper-cobalt project in Sweden, which is optioned to Sienna Resources Inc. (“Sienna”). This work followed-up on Sienna’s earlier drill program that returned intercepts including 2.8 meters averaging 1.05% nickel, 1125 ppm cobalt and 0.79% copper in hole SIE-18-3 (true width 60-70% of reported interval length)16. Slättberg was optioned to Sienna for share equity in Sienna, and upon Sienna’s earn-in through work commitments for 100% interest in the project, additional share equity will be due and EMX will retain a 3% NSR royalty on the project17. Geochemical sampling and geophysical surveys were completed over a number of EMX’s “Gold Line” licenses in the Skellefteå area in central Sweden. 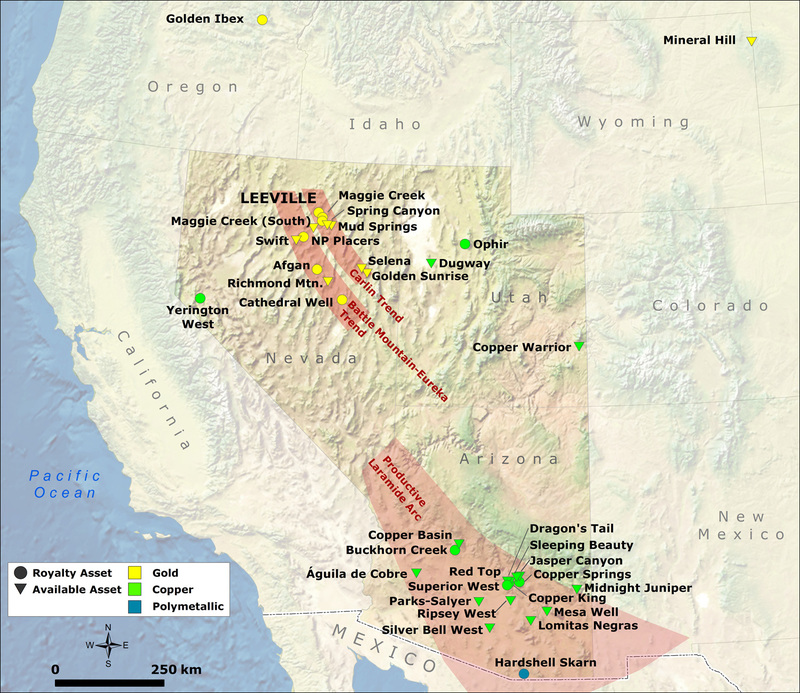 Multiple geochemical sampling techniques were tested in orientation surveys across several areas with historic, drill-defined zones of gold mineralization. Results are pending, but this work is intended to identify methods appropriate for recognizing additional zones of gold mineralization hidden beneath shallow glacial till cover. Ground based magnetic surveys and extensive stream sediment sampling surveys were also conducted across the project areas. Preliminary stream sediment data have highlighted drainages with newly recognized anomalous gold signatures. Follow-up work, including additional geophysical surveys and surface sampling and mapping, will take place in the winter months and into the spring and summer of 2019. Other Assets. EMX’s portfolio in Australia and New Zealand consists of orogenic gold, epithermal gold-silver, sediment hosted stratabound copper, and copper-zinc skarn royalty and royalty generation projects. EMX’s organically generated 0.5% NSR royalty portfolio in Haiti covers gold and copper exploration properties held by Newmont Ventures Limited, as well as the Grand Bois project which is controlled by a privately held Nevada corporation. Other Company News. EMX is pleased to announce the appointment of Lori Pavle as Corporate Secretary, taking on the position previously held by Marien Segovia. EMX thanks Ms. Segovia for her service to the Company, and extends best wishes for her future endeavors. Ms. Pavle has over 20 years of experience in the administration of natural resource companies listed on the TSX and TSX Venture exchanges, with appointments that included Corporate Secretary, Corporate Administrator, and Legal Assistant. The Company welcomes Lori to the EMX team. Pursuant to the Company’s Stock Option Plan, an aggregate of 60,000 incentive stock options, exercisable at a price of CDN $1.57 per share for a period of five years, has been granted to Ms. Pavle along with a signing bonus, through the issuance of an aggregate of 21,000 common shares, subject to any applicable stock exchange approvals and vesting requirements. The Company also announces that upon successful completion of the sale of the Company’s interest in the Malmyzh Project in Russia, a discretionary cash bonus has been allocated in an aggregate amount of US$3.8 Million to executive directors, officers, employees and consultants of the Company. The recent advancements of the Company’s asset portfolio underscore EMX’s focus on steadily increasing global revenue streams from strategic investments, royalties, and other payments. The Company’s goal is to substantially grow our cash flowing royalty portfolio while providing multiple opportunities for exploration and production success. 1 See EMX news releases dated October 30, 2018. 2 See Newmont Investor Presentation - August 2018. 3 See AMI news release dated August 10, 2018. 4 See South32 Financial Results & Outlook Year Ended 30 June 2018 dated August 23, 2018. 5 See EMX news releases dated August 30, 2017. 6 See EMX news releases dated February 28, 2017. 7 See EMX news release dated August 8, 2016. 8 See EMX news release dated April 17, 2018. 9 See EMX news release dated August 13, 2018. 10 Note: EMX’s 0.5% NSR royalty is subject to reduction only as provided in the royalty agreement. 11 See Nevsun news release dated September 5, 2018. 12 See Nevsun news release dated August 7, 2018 and Sedar filed Technical Report. 13 See Nevsun news releases dated March 28, 2018. 14 See Boreal news releases dated July 4, September 19, and September 26, 2018. 15 See EMX news release dated April 19, 2018. 16 See Sienna news release dated May 17, 2018. 17 See EMX news release dated December 4, 2017.